Five centuries before Christ, Socrates gathered young people about him to think about some of the most important questions of their time. As Dr. Patrice Rankine addressed the members of the incoming Class of 2018 during Hope College’s Opening Convocation on Sunday, Aug. 24, he noted that the process—thinking deeply, considering connections and leading the “examined life”--is just as relevant some 2,500 years later. “What we need today, right here, right now, are young leaders who are full, human beings, who live the kind of examined lives that Socrates spoke about: doctors who can work in teams, have empathy, and maybe even speak other languages and have studied abroad, immersed in another culture; and engineers who understand American cities and truly build for the future, for everyone,” said Rankine, who is the dean for the arts and humanities and a professor of Classics at Hope. Rankine noted that such growth can happen in unexpected ways, not only in the classroom but beyond. He shared, for example, that his own undergraduate education at Brooklyn College in New York was enriched by a professor of Ancient Greek, Howard Wolman, who invited his students to his Greenwich Village home for cuisine and conversation. “What did a dark-brown, Brooklyn-born boy, the first generation American son of Jamaican immigrant parents, know about Brie cheese, rare steaks or political debate?” he said. 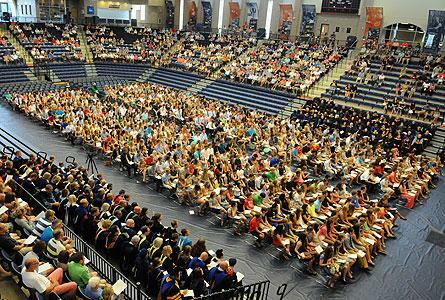 Approximately 2,000, primarily new students and their families, attended the convocation, which was held in the college’s Richard and Helen DeVos Fieldhouse and marked the formal beginning of the college’s 153rd academic year. The new students arrived on campus and began orientation activities on Friday, and the college’s fall semester classes start on Tuesday. In particular, Rankine said, King challenged his audience to look beyond assumptions and difference in relationship with others. “King pushes us to think about life together in the hardest possible way, namely that the enemy, the antagonist, the person who looks, thinks, believes and operates in a totally different way from me is also my friend, a child of God, loved by someone,” Rankine said. Such questions, Rankine noted, would be a cornerstone of the education that the students were about to experience at Hope, helping them grow further into lives that will make a difference in the world.